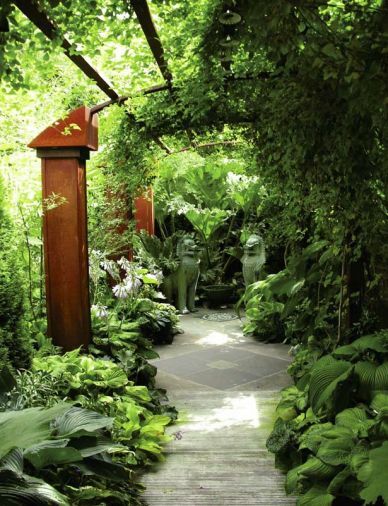 Much of the foliage at the home of landscape designer Michael Schultz and his partner Will Goodman was chosen for its broadleafed, tropical feel, and for the way it creates a sound and sight barrier from the city’s hustle and bustle. 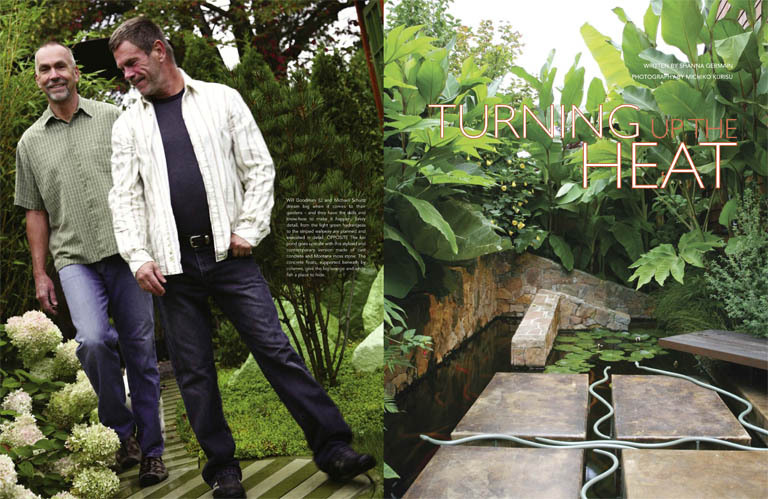 Will Goodman (L) and Michael Schultz (R) dream big when it comes to their gardens – and they have the skills and know-how to make it happen. Every detail, from the light green hydrangeas to the striped walkway are planned and executed in detail. 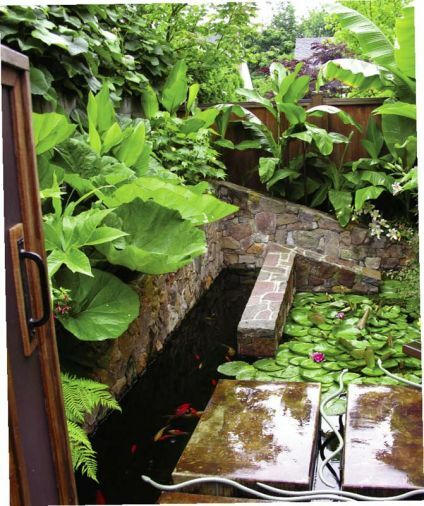 The koi pond goes upscale with this stylized and contemporary version made of cast concrete and Montana moss stone. The concrete floats, supported beneath by columns, give the big orange and white fish a place to hide. 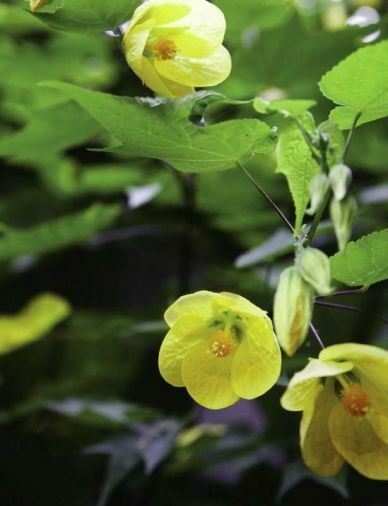 The yellow bells of the malvaceae shrub, also known as Moonchimes, add a splash of tropical color. 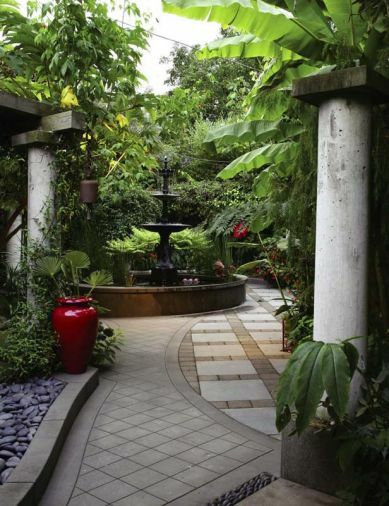 The three and a half foot wide walkway is made of concrete that’s combed while wet to give it an unusual texture, and then acid-stained for color and extra dimension. 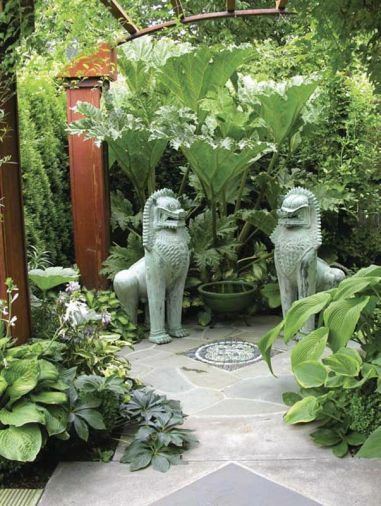 At the end of the walkway, two cast bronze Thai temple lions greet visitors. The couple saved this old church door for years before they found the perfect place for it. They had the gate built to match and added the hardware. 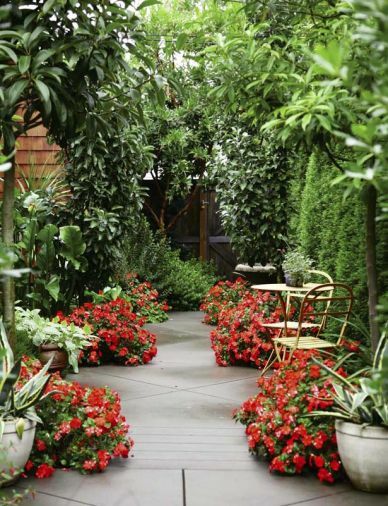 Fiery impatiens are the final touch to this creative, yet secluded, setting for small café-style tables. Artist Rick Zook was commissioned to create a black and turquoise pebble mosaic, to play off the patina of the bronze Thai Temple Lions, a find from a local estate sale. 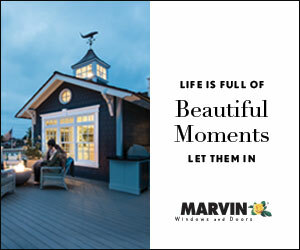 Goodman’s painting studio sits in the back half of the double-deep garage and opens onto the garden. To create the checkerboard look of the studio’s patio, the couple made deep cuts into the concrete while it was still green, then used a water-base acid stain on certain squares. Large leaves and vibrant foliage characterize the tropical nature of the garden. 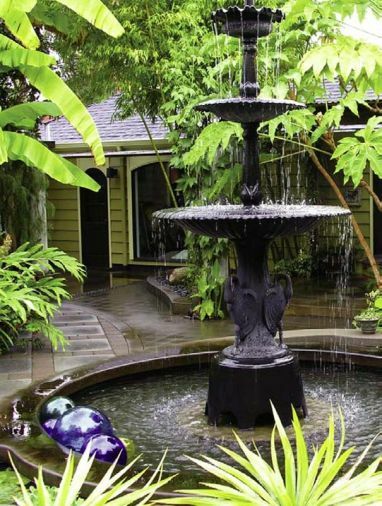 A three-story cast iron fountain is, in many ways, the garden’s centerpiece. Cast concrete, such as the fountain’s base and the tall columns, are one of the couple’s favorite materials. Hardy banana trees and other tropical plants overlook the area and provide shade and shelter. 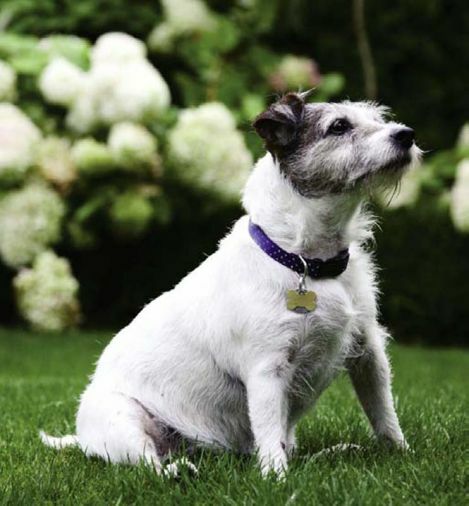 “Snack,” the couple’s fourteen-year-old Jack Russell Terrier, has free run of the gardens. Good thing, because she’s got a lot of energy to burn. Imagine the whisper of broadleafed plants rustling together. The slow, steady trickle of water over a fountain. A collection of plants painted in warm yellows, gorgeous greens and vibrant reds. It sounds a little like a tropical paradise, doesn’t it? Surprisingly, this is a backyard near you. 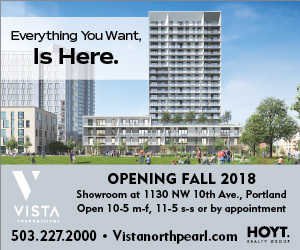 Right in the middle of rainy, noisy Portland, as a matter of fact. 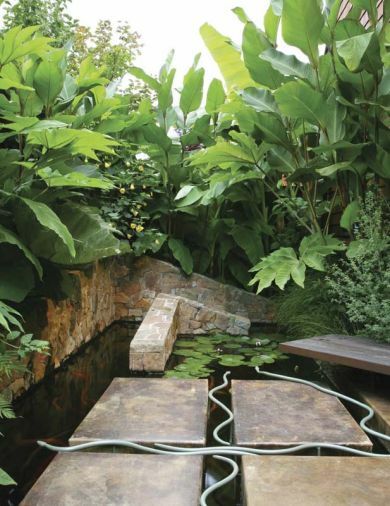 One of the most intriguing “structures” is the unusual and modern koi pond. “A few years ago, we thought, ‘Oh let’s have a few fish, just for fun,’” says Goodman. “But over the years, the fish got bigger and had babies and then we had lots of fish. We realized it was time for a larger koi pond.” The new pond has a concrete bottom with concrete walls. The two flange walls that jut out of the water are also cast concrete covered with a stone veneer of Montana moss stone. 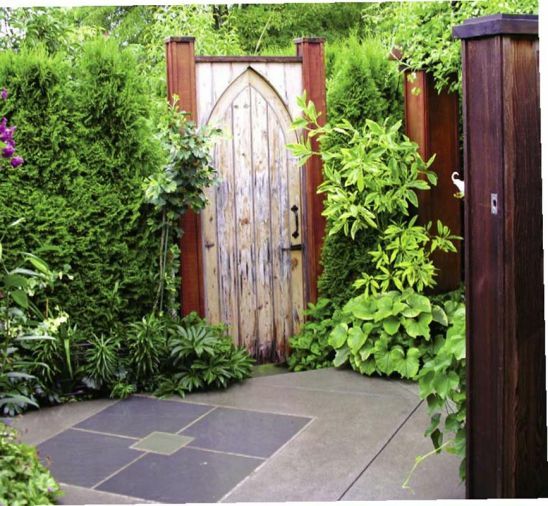 Despite their focus on design and hardscapes over greenery, the couple knows a lot about what they plant in the garden, and they choose their plants as carefully as they do their sculptures. In fact, Schultz can give the Latin names of most of the plants in their backyard. They practically roll off his tongue, from the Malvaceae shrub (you might know it as Moonchimes) to the Sempervivum tectorum (simply, hens and chicks). “We played more on the strength of a plant for its foliage and form rather than its flower or color,” says Schultz. To that end, they aimed for a tropical feel, using big-leaved plants such as hardy banana trees, which can grow up to 18 or 20 feet and are hardy to almost zero degrees. 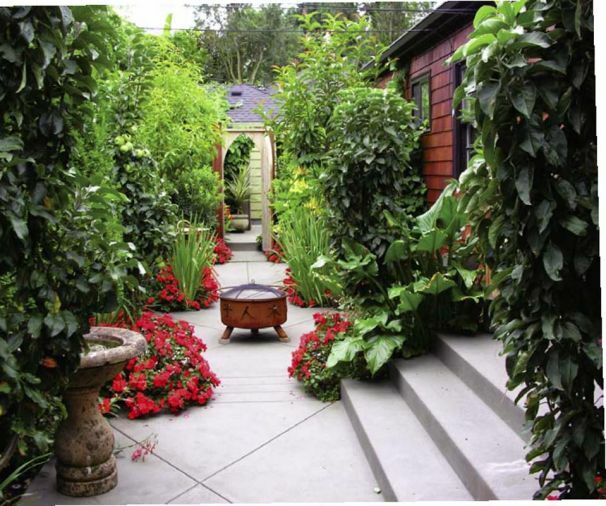 Looking at their gardens now, the couple is pleased with what they’ve created, despite the amount of work that went into it. 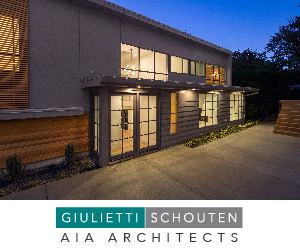 “The thing I like most is that we have created a garden that is seeded with interest and variety while at the same time creating a relatively low-maintenance environment,” says Schultz.